The Eco-Shredder ES1600 14 AMP Electric Chipper is an excellent pick to choose between high and low-end wood chippers. It’s the best wood chipper on our list as its powerful capabilities make it the most remarkably priced model on the market today. Based on the variety of wood chippers out there, this one is relatively less expensive, but with dynamic features. It features a 14-amp electric motor with a solid construction that is thoroughly controlled to knuckle things down robustly without any hassle. It can feed material in two versatile ways: a side chute for branches and a hopper on top for small debris like twigs and leaves. The most compelling quality of the Eco-Shredder ES1600 14 AMP Electric Chipper is how easy it makes the process of cleaning up the yard with its three-way feed and three-cycle shredding and mulching system that ensures quick and consistent results. It is designed for maximum portability with its compact construction and seven inch wheels. According to our extensive research, the Eco-Shredder ES1600 14 AMP Electric Chipper is popular for its functionality of separating leaf and twig mulching from branch chipping. It also features a safety add-on such as the overload protection switch that will automatically turn off the 2.5 horsepower motor in case of a persistent jam. It is also identified that this best wood chipper has got all it takes to perform in quiet and clean operations than most other electric and/or gas powered wood chippers. Equally important is its affordable price. Even though the Eco-Shredder ES1600 14 AMP Electric Chipper is significant in reference to its performance and construction, it is marked down on its price, making it the most desirable wood chipper on the market. If you’re looking for a wood chipper that offers versatile shredding and chopping stages and that is also efficient at mulching twigs and leaves, this one is the ideal pick for you. With its top hopper and V-type blade design, this wood chipper provides constant maintenance to break down yard waste, downed limbs, etc. into mulch, effortlessly! Considering all the best wood chippers on the market presently it can be concluded that opting for one that’s gigantic in price as well as persuasive in performance is imperative as a buyer. Such is the Earthquake 14267 Chipper Shredder. It is designed to stem all different kinds of debris, especially for larger yards. It’s a powerful and heavy duty gas powered wood chipper with a solid viper engine construction that offers formidable durability and precision. The traditional interpretation would be to opt for the best wood chipper that’s popularly priced on the market with decent characteristics and endurance, but the Earthquake 14267 Chipper Shredder beats those interpretations. It stands as the extravagant, but valuable wood chipper offering much more than just procedural mulching the standard wood chipper. With its 10 inch wheels, this is slightly heavyweight, yet sturdy and portable to handle. It features dual 2-inch cutting blades to chip down hardwood limbs up to 3-inches smoothly. It can also procreate soft mulch after cutting down the materials with its J-hammers and Tri-hammers shredder mechanism system. Even though it’s an expensive pick for you, it is relatively less expensive than other similar performing wood chippers. The wheels maintain a fixed handle while chipping and jams are uncommon with the Earthquake 14267 Chipper Shredder. If you’re looking for something that gives you full control, but with much greater functionality for small to large-sized yards, the Earthquake 14267 Chipper Shredder is the one for you. Similarly, a best wood chipper guide is one that brings forth all possible choices to suit the desired demands of our readers. To conclude, the Sun Joe Chipper Joe CJ601E 14 AMP Electric Wood Chipper is yet another great alternative, but it’s of more significance to you because it’s budget-friendly with high-performing qualities. Especially designed to operate smoothly on small yards, this wood chipper is durable, versatile, user-friendly and definitely a great value for your money. 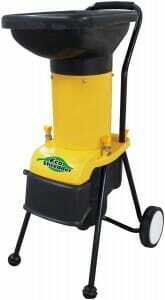 It makes the cleanup simple and fast with excellent results unlike similarly priced wood chippers on the market. Its lightweight construction has a powerful 14 AMP motor with 1.5 inches maximum branch size. It also has double-sided blades that promises endurance before it requires any repairs such as sharpening. It’s a popular lightweight and small-sized machine that is easy to move around the yard with a simple on-and-off button system. Being an entry-level wood chipper, it’s got the characteristics to help both novices get a handle of features that would generally be fitted into a much more superior wood chipper. The Sun Joe Chipper Joe CJ601E 14 AMP Electric Wood Chipper can knuckle down small debris for hours without jamming, which makes it a straightforward wood chipper to use by both a learner and an expert. What to look for in a wood chipper? Wood chippers are designed to finely break down organic material into lesser and petite pieces for mulching or composting. Most residential wood chippers are capable of chipping wood into lighter mulch as well as cutting down wood and other debris such as leaves, grass, etc. effortlessly with certain specific features. A good wood chipper is one that’s portable, sturdy, powerful, and that lasts 10 to 20 years for small to medium-sized yards and 5 to 8 years for large yards with more wood and other debris. Based on our findings of the best wood chipper on the market, it can be suggested that each wood chipper offers a unique price and performance that has the ability to suit every chipper’s needs separately. The wood chipper’s conforming purpose of reducing wood into smaller woodchips has made it an in-demand machine for residential as well as commercial uses. Even though these are usually utilized in industrial lumber applications, home owners can also get the best out of a wood chipper to reduce yard waste into something that is organic and environmental friendly for future use. After having the knowledge of how a good wood chipper functions, these factors can predict one that’s best for you. Following are the qualities you should consider to purchase and review the best wood chipper on the market. A sturdy construction lays the foundation of a good wood chipper that lasts longer and that which endures long hours of operation without lagging or facing any other common defects most often experienced in standard wood chippers. You want your wood chipper to be user-friendly when it comes to determining the exterior design for accessing certain buttons, handles, etc. You would also want it to be built from high-quality materials as that promises endurance and better maintainability of the wood chipper for heavy usage. The construction of the best wood chipper also determines its weight: as for occasional chippers, a lightweight one is the best bet, but for frequent chippers even heavy-duty beast can knuckle down complex tasks in a simplified manner. Based on our research, gas-powered wood chippers are slightly noisier than electric wood chippers, but they don’t surpass the sound standards to causing inconvenience to its users. You want one that produces less noise even after prolonged operations on the yard. After carefully examining multiple wood chippers, we have listed out the most user-friendly and convenient products in terms of sound level so you know what you’re missing out on if you wouldn’t have opted for a detailed guide such as this. The reduction ratio for an ideal wood chipper is typically from 10:1 to 20:1. It’s a nominal measure of how small the volume of unprocessed debris can reduce down to with a wood chipper. Electric wood chippers require less maintenance over the years as opposed to gas-powered wood chippers which require more attention to care. You want a good wood chipper that’s persuasive with quality standards and is identified as one without generally occurring defects such as jamming, temporary blockage, etc. An automatic shut-off feature is preferable if you know there’s heavy wood chipping to do in a day. With an automatic shut-off feature, a wood chipper instantly stops functioning as soon as a jam occurs, preventing any further damage. Whichever wood chipper you decide to purchase, it should consist of safety standards. Every wood chipper model comes with a specified branch size that allows you to determine its limitations and maximum capacity before it causes any safety damages while chipping. Also, compare warranties on each product to get a sense of quality and deliverability of the wood chipper beforehand. At the time of purchasing a wood chipper, it is essential to know that the best wood chipper isn’t a universal one, yet there are a few ones that we’ve covered that are all-encompassing in reference of purpose, performance, price, type and weight. These contenders will guide you towards the right direction and hopefully, even convince you to opt for one which is superior in performance and self-assured. While it is undeniable to single out one that takes up less space, is economical, lightweight, and warranted. But when it comes to a wood chipper, you want something that reduces yard debris to a material more defined and usable for composting or other purposes. If you’re looking for a wood chipper with powerful performance on large yards with more chipping, shredding and/or grinding, the best wood chipper is one with a slightly heavier cost than the rest. On the one hand, the Eco-Shredder ES1600 14 AMP Electric Chipper makes mulch easy to procreate with its compact design and powerful motor, and on the other hand it makes silent and smooth operations at brilliantly affordable prices. This goes to show that this is the best wood chipper out there that can knuckle down complex chipping, shredding and mulching tasks more impressively than other standard models. Running at 2800 RPMS, this wood chipper features a three-way feed including a top hopper to withstand twigs, small branches, and other debris along with a side chute that lets in branches up to 1-3/8 inches in diameter. The Eco-Shredder ES1600 14 AMP Electric Chipper is a time-saving bet, allowing you to procreate your own mulch from your own yard without much hassle. If you’re looking for a wood chipper that lets you create your own personalized mulch and organic garden from scratch effortlessly, this is the ideal product for you. Even after trimming and raking the leaves, with its rounded discharge chute, you can cleanup and maintain your organic garden impressively. Its seven inch wheels are accustomed for smooth transportability and sturdiness. With a 10:1 reduction ratio and a top hopper design, the Eco-Shredder ES1600 14 AMP Electric Chipper will not fail to impress you with its unique capabilities and deliverance. The Earthquake 14267 Chipper Shredder is a great power chipper that quickly transforms yard waste into compost and mulch as well as handle branches up to three inches in diameter with a lot of persistence. Even though its price is upscale, the characteristic that contributes to its market value is the 212CC, four-cycle Viper engine. It is worthier than the standard industrial-grade wood chipper because of its power, capacity and construction. The Earthquake 14267 Chipper Shredder has two defined methods to feed material in: a top hopper for smaller items and second, a side entry for branches. This clever circulation ensures that your yard is kept neat and clean for organic waste during and after the operation is finished. It also has a two-bushel collection bag of 18 gallons as well as plastic baffles to prevent debris to fly back out when you position it in the hopper. Despite its complex functionality, this wood chipper has a transparent and easy-to-use feature menu which many users, according to our research, have loved. It makes a complex beast look like a simplified engine. If you’ve got a huge yard to work on and don’t want to added hassle of the electric cable spread all over, this gas-powered wood chipper is perfect for you. It consumes very little space, although it is a heavy machine, but it provides very less maintenance and more control to chippers throughout the operation. You’d be surprised with how the top chute takes control of leaves and other debris. Other than that, this best wood chipper also stands all-powerful in terms of safety because its baffle stops material from flying back out considering it is a powerful tool to use. For comfortable wood chipping, the Earthquake 14267 Chipper Shredder’s performance is sky-scraping as it can cut straight branches up to 3 inches. Now you know why this beast costs extravagant, but has such a tremendous caliber to perform complex tasks easily. Our extensive research goes on to state that the Sun Joe Chipper Joe CJ601E 14 AMP Electric Wood Chipper is one of the most economical and valued wood chipper on the market. It is a proud product of Snow Joe, which is a distinguished brand name on the market with many other successful power tools and products. The Sun Joe Chipper Joe CJ601E 14 AMP Electric Wood Chipper has a robust 14 AMP motor with 4300 RPM with is capable of handling branches of 1.5 inches and below. It’s a lightweight shredder that is capable of turning yard lumber into organic waste in a fast form. With its 6-inch wheels, it’s a highly portable machine with a special lock safety feature on the hopper that eliminates the motor from functioning during blade changing, cleaning or jamming; this is the time when the hopper is open and exposed. It’s an affordable pick with an instant start feature with a push of a button. It has extended life because of its double-sided blades and a reduction ratio of 10:1 which keeps the operation running consistently and smoothly. The Sun Joe Chipper Joe CJ601E 14 AMP Electric Wood Chipper is the best wood chipper for those in search of a particular machine that is entry-level, but extremely professional, lightweight, but with solid construction, and finally, user-friendly, but with a knack of letting chippers get accustomed to even complex mechanisms. The LawnMaster FD1501 Electric Chipper Shredder is a powerful 15 AMP motor that’s designed to convert unwanted yard rubbish into fresh organic mulch. It can cut branches up to 1-1/2-inch diameters with a reduction ratio of 10:1. It’s an extremely mobile machine with an additional collection bag that lets you transport your materials from inside the machine itself. With its 8-inch wheels, it is portable, convenient and smooth to transport wherever you’d like in your backyard. It’s the best wood chipper for home use because it offers multiple additional convenient features such as the push stick which helps adjust and fit branches and leaves into the shredder. It also has an overload protector which notifies if you you’re surpassing or overloading the chipper. The LawnMaster FD1501 Electric Chipper Shredder makes an excellent alternative to gas-powered wood chippers as it supports environment friendly operations and results. The machine is specifically designed to chip wood branches up to 1 1/2 inches wide. It’s easy to move and makes a beautiful chipping product with a soft and steady pull. This one is our second best pick for wood chippers for home use because of its chipping power that delivers 10 horsepower Briggs engine for powerful mechanics accustomed with a solid construction. It is designed to make complicated tackling extremely simplified and smooth. With the installation of the Briggs & Stratton Vanguard commercial engine, the Patriot CSV-3100B 10 HP Wood Chipper is by far the best wood chipper to use by chippers of any skill level. It can quickly chip away branches that are 3 inches thick into mulch that’s usable. You won’t find any belts or pulleys that are replaceable for Patriot’s patented direct drive system as it drives all its power directly into chipping and shredding. For smooth operations, an outboard bearing tool functions alongside a super lo-tone muffler to reduce noise. This wood chipper challenges the idea that price over quality is more imperative while considering to purchase an innovative and powerful wood chipper. The Patriot CSV-3100B 10 HP Wood Chipper also comes with a special feature such as the low-oil run sensor that helps prevent the engine from getting damaged. The engine also consists of an overhead valve design to keep the engine running cool even during long operations; this is a common defect in most wood chippers as the engine gets either too hot or too noisy to operate, which is why one is forced to shut off the wood chipper completely in intervals. As an interested buyer, you don’t only require the best of the best amongst all other wood chippers, but you also require specialized picks that are tailored to suits specific needs. The GreenWorks 24052 15 AMP Electric Wood Chipper is our best electric wood chipper on the market. It features a powerful 15 AMP motor with a lofty electric start which is perfect for a electric powered shredder to take on cutting thick branches like a pro. It is proven to exceed expectations in terms of price, quality of construction and performance. The GreenWorks 24052 15 AMP Electric Wood Chipper has more starting power that directs up to speed immediately and it also consists of an additional set of reversible blades. After researching robust electric wood chippers on the market today, we came to a strict conclusion that this best wood chipper is lightweight, sturdy and easy-to-assemble compared to others within the similar price range because of its maximum cutting diameter of 1-3/8 inches. This wood chipper eliminates unnecessary time off your chipping hours to more than half with a perfect finish with a 7 inches wheels and a push paddle for easy disposal and movement; so what would have otherwise taken you a day or 2 to finish, this chippers takes close to about an hour or 2 easily. It’s designed to deliver excellent performance at a quick, but efficient pace, all at an affordable price label. The WORX WG430 13 AMP Electric Wood Chipper is a high mulching machine with flex-a-line bladeless mulching feature along with its 13 AMP motor that delivers 8500 RPMS. You can proudly showcase this wood chipper which is our second best electric wood chipper after the GreenWorks 24052 15 AMP Electric Wood Chipper as something you use to keep the environment clean while conducting complex mechanisms which otherwise would release noxious air and loud noises. It’s a simply-designed and easy-to-use with a tool-free assembly that keeps you concentrated on the bigger task at hand, which is mulching. This wood chipper is lean in construction, but sturdy to transport from one corner to another. It has an 11:1 mulch ratio that is capable of turning 13-inches diameter in fine small debris instantly. There’s nothing to storing this best wood chipper as its compact design makes it simple for chippers to keep it at an accessible place anywhere they wish to. If you’re looking out for a dust-reducing, low sound level and environmental friendly wood chipper with an added clean-air motor cooling system, the WG430 13 AMP Electric Wood Chipper is the ideal choice for you. Following the two best electric wood chippers, this one is our best wood chipper that’s gas-powered. Traditionally, many novice and professional chippers didn’t prefer a gas wood chipper because it caused lots of inconvenience in terms of sound level, maintainability and even longevity, but with the advancement of technology, latest gas wood chippers have industrial-graded characteristics and powerful mechanism to make chipping an environmental-friendly and user-friendly tool for chippers; such is the Yard Machines 24A-45M4700 Gas Chipper. It features a 208cc Powermore OHV 4-cycle engine with a 10:1 debris reduction ratio and 2 inch chipping capacity. It also comes with a 2.5 bushel bag capacity to ensure complete convenience and easy transportability to its user. It has a 3 way feed system with 10 inches wheels that ensure smooth operations without any unwanted jamming or maintenance repairs. Also, it has a poly drop down and rake in hopper which means that you can any material in the chipper with minimal pruning of side branches. The Earthquake 9060300 Wood Chipper is a heavy-duty gas-powered wood chipper that maximizes chipping power to make the process paramount yet painless. It has a patented triangular hammer design that is constructed to triangulate the force hence increasing shredding and chipping power, making it drastically quick and effective compared to other gas-powered wood chippers. With a Briggs and Stratton Engine, you get stamina and endurance-two dominating qualities in one. It can chip away dry branches that are 1.5 inches in diameter and 10 feet long in less than a minute. It is a solid constructed machine that feeds on branches up to 3 inches in the chute. It’s packed with super impressive qualities for a gas-powered wood chipper on the market, all at an affordable price. It is a super powerful and reliable wood chipper as reviewed many satisfied customers who have tested this product out over a period of months. Many positive reviews also mentioned that by comparison, the Earthquake 9060300 Wood Chipper has more power than it can carry at once with smooth functionality; also it has bushel bag that’s made from a heavy duty fabric with a pull cord around the opening. The chips are made from quality materials that make the chipping process, especially for a long period of time, more consistent and efficient. You will also find that this wood chipper releases no disturbing noises even after regular use. So, you know why this is our second best gas wood chipper on the market currently. The Flowtron LE-900 Electric Wood Chipper is our exclusive lightweight wood chipper which, after scrutinized research, is the only prevalent wood chipper out there that’s powerful, sturdy and promising. It comes with a unique hopper and funnel that prevents sudden material throwback that can become messy most times. It has a powerful electric motor that’s thermally protected with an instant on and off switch and an additional overload feature. It also has a special tilt adjustment that lets chippers rotate 180 degrees full way for convenient storage and usability. It is the product designed from a patented label, double dominating cutting lines that chips, shreds and mulches material instantly. You can even assemble the Flowtron LE-900 Electric Wood Chipper with ease because of its removable motor functionality which makes it easier for you to clean and maintain it as well. It’s great to move around as it has built-in easy carrying handles and a compact design for storage. Its solid construction promises endurance and sustainability for long years with minimal maintenance and other repairs that otherwise are consistent with other standard lightweight wood chippers. It won’t fail to impress you with its powerful features, high-performance and flexible protection features. Transforming current heavyweight wood chipper standards, this best wood chipper is one that brings solid performance deliverable and the ultimate chipping experience and control to its users, the DEK CH1M15 420cc Gas Wood Chipper is specifically built for durability and powerful landing. It features a sturdy and hardened steel cutting blade with 16 hammers, which is unmatchable on the market today. It has a belt driven tool with centrifugal clutch that helps protect the powerful engine from heating and lagging behind after regular usage. It can chip branches into 1/4 inches wood chips instantly without making any unwanted noises and emitting polluted air into the environment. It’s super environment-friendly and user-friendly to ensure that chipping doesn’t become a hassle for you anymore, no matter how often you do it. Its overall construction is superb to even sharpen the blades and for storage uses. Despite its heavyweight characteristic, the DEK CH1M15 420cc Gas Wood Chipper is one to consider and review strongly for when you’re searching for a powerful chipper that makes complicated tasks much less burdensome and time-consuming. After considering the purpose of a wood chipper and its noteworthy features to consider when buying one that suits your needs, we’ve compiled a detailed list of the best wood chipper on the market followed by one that’s expensive, but with convincing features and one that’s budget-friendly. We know our way around complicated power tools and wood chippers, shredders and other mulching tools, which is the sole reason why our specialized lists will guide you to make an informed decision that you won’t regret about later. Most wood chippers have full knowledge over how well their wood chippers can perform, that helps them make abundant use of their machine and keep it safe and in good condition. As for our best wood chipper, the Eco-Shredder ES1600 14 AMP Electric Chipper, its serviceability is universally defined for both occasional and frequent chippers of any skill level. Still, it’s fitting that you buy one that is suitable for your purposes such as for home use on small to large-sized yards. Only then can you refer to this detailed guide almost exclusively to help you make that big decision.